1 Happy New Year all. Very cloudy with Sc with sometimes a few spots rain. Top Tmax: Kleine Brogel 6,6°C, Zaventem had 5,3°C, in my garden 5,6°C. Still snow over high grounds between 3-6 cm. 2 Cloudy to very Sc cloudy with Tmin -1,2°C. During the early forenoon a few gaps in the cloud base, but tempo also some slight rain in afternoon. Fog patches coming in from 2030 onwards. Top Tmax: Koksijde: 7,3°C, Zaventem had 4,9°C, in my garden 4,6°C. Top snow cover: St-Hubert 2 cm. 3 Freezing fog, during the night becoming St overcast, but before that, Tmin was reached with -3,3°C. During daylight hours remaining foggy but in the afternoon the sun was a couple of times vaguely visible. After 1700 becoming misty. Towards midnight a few snow flurries. Top Tmax: Ghent 5,4°C, Zaventem had 1,7°C, in the garden 0,2°C. Top Tmin: Brasschaat -5,9°C. Top snow cover: St-Hubert 2 cm. 4 Breaking Sc clouds after sunrise and a lovely sunny, but cold, day. Towards sunset Sc fields came in from NE. Top Tmax: Koksijde 5,0°C, Zaventem had 3,3°C, in my garden 3,0°C. Top snow cover: Elsenborn & St-Hubert. 5 After some breaks with Tmin -0,9°C, becoming very Sc cloudy after 0400, which stayed all day long. Some snow flurries between 2000-2100. Top Tmax: Ghent 1,8°C, Zaventem had 1,1°C, in the garden 1,3°C. Still 1 cm snow cover Elsenborn & St-Hubert. 6 Clearing skies from 0200 on with Tmin in garden -2,6°C. Quite sunny day with a few St rags, but misty till noon. After 1800 becoming very cloudy with Sc and again misty. Top Tmax: Kleine Brogel 4,2°C. Zaventem had 2,0°C, just like in my garden. Still 1 cm snow in Elsenborn & patchy snow at St-Hubert. 7 Tmin in garden -1,2°C. Lots of Sc fields, tempo large breaks late afternoon. Top Tmax: Ghent 4,6°C, Zaventem had 2,8°C, in my garden 3,0°C. Unchanged snow conditions over the hills. 8 Tmin in garden -1,4°C. Cloudy day with Sc & Ac fields. Top Tmax: Kleine Brogel 5,4°C, Zaventem had 3,6°C, in my garden 3,4°C. Unchanged snow conditions over the hills. 9 Tmin in garden -3,2°C. Top Tmin at Elsenborn -7,7°C. Lovely sunny day with tempo some Cirrus. Top Tmax: Charleroi 9,3°C, Zaventem had 6,2°C, in my garden 4,3°C. Snow patches over the hills less than 1 cm (Elsenborn had Tmax of 8,0°C). 10 Tmin in garden -3,2°C. Top Tmin Elsenborn -6,3°C. Partly cloudy to cloudy with besides Ci Cs tempo some Sc & Ac fields. Top Tmax: Brasschaat 6,6°C, in my garden 6,0°C. 11 Tmin in garden 0,0°C. Very cloudy with light rain between 1100-1700 giving 3 mm. Afterwards remaining very cloudy and turning misty from 2100 on. Top Tmax: Koksijde & Ostend Pier 7,7°C, in my garden 4,4°C. Snow unchanged over the hills. 12 Very cloudy to overcast with St, towards the evening lifting to Sc. Top Tmax: Ghent 5,1, Zaventem had 4,2°C, just like in my garden. Snow unchanged over the hills. 13 After sunrise the Sc clouds disappeared, leaving some Cirrus. Top Tmax: Brasschaat 4,9°C. Zaventem had 4,7°C, in my garden 4,4°C. Snow unchanged over the hills. 14 Tmin around -1,0°C. Sunny day with some Cirrus. Top Tmax: Ghent: 8,6°C, Zaventem had 6,7°C, in my garden 6,3°C. Snow unchanged over the hills. 15 Tmin in garden -4,4°C, lowest in Belgium at Elsenborn with -9,8°C. Lowest in Flanders: Kleine Brogel -5,8°C. Sunny day with some Cirrus. Top Tmax: Ukkel 6,7°C, Zaventem had 5,5°C, in my garden 4,4°C. Snow unchanged over the hills. 16 Tmin in garden -2,9°C. lowest in Belgium: Spa -7,6. Lowest in Flanders: Kleine Brogel -6,1°C. Sunny with some Cirrus, towards sunset increasing Ac, Sc and tempo slight rain between 1800-1900. Top Tmax: Ghent 6,9°C, Zaventem had 6,4°C, just like in my garden. Snow unchanged over the hills. 17 Light rain between 0700-1200, intermittent light rain between 1430-1630 and slight drizzle between 1800-1900: 8 mm. Top Tmax: Koksijde 8,4°C, Zaventem had 7,2°C, in the garden 7,1°C. Top snow: Elsenborn 6 cm, slowly melting away during the evening. 18 During the night large breaks, from 0600 on becoming very cloudy with Sc, from noon on lowering to Stratus. Tempo intermittent light rain between 1200-1500 giving almost 1 mm, afterwards clearing skies. Top Tmax: Brasschaat 8,0°C, Zaventem had 7,1°C, in my garden 7,4°C. Top snow cover at Elsenborn 2 cm. 19 Very Sc St cloudy with light drizzle around 1100 and from 2230 on. 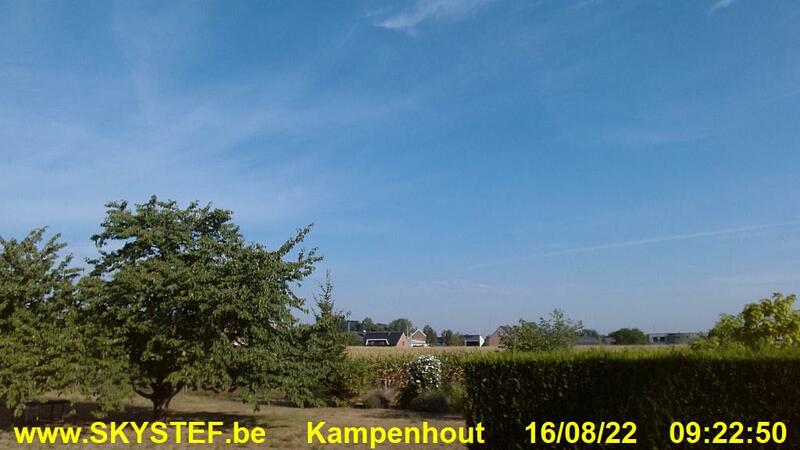 Top Tmax: Ostend 11,3°C, Zaventem had 9,3°C, in the garden 10,1°C. Top snow cover at Elsenborn 1 cm. 20 Very cloudy with drizzle between 0000-0800. Rain between 1400-1530 giving 3 mm and afterwards clearing skies. Top Tmax: Brasschaat & Zaventem 10,6°C, in my garden 11,2°C. Few snow patches of less than 1 cm left at Elsenborn. 21 Partly cloudy night, after sunrise becoming very Sc cloudy with showery rain between 1000-1100. Small breaks in afternoon, again some light rain between 2100-2200. Top Tmax: Koksijde 8,3°C, Zaventem had 7,2°C, in the garden 7,6°C. Few snow patches of less than 1 cm left at Elsenborn. 22 All day long Sc overcast. Top Tmax: Ostend 4,6°C, Zaventem had 3,8°C, in my garden 3,7°C. Few snow patches of less than 1 cm left at Elsenborn. 23 Clearing skies from 0500 on, sunny day with some Cirrus. In garden Tmin -2,6°C, Tmax 1,6°C. Top Tmin: Elsenborn - 8,2°C. Top Tmax: Ostend & Chièvres 3,0°C, Zaventem had 1,0°C. Still a few snow patches left at Elsenborn. 24 Sunny day with lots of persisting condensation trails. Gardens Tmin: -5,9°C & Tmax: 2,3°C. Top Tmin: Elsenborn -7,0°C, Deurne had -6,3°C. Top Tmax: Liège 5,0°C. Still a few snow patches left at Elsenborn. 25 Clear night with Tmin in garden -6,7°C. After a sunny start invading Sc clouds from 1000 on with some light snow between 1130-1200, followed by some sleet till 1300. Tempo large breaks in afternoon, later a few light rain showers. Top Tmax: Koksijde 6,5°C, Zaventem had 3,8, in my garden 3,4°C. Top Tmin: Brasschaat -8,4°C, Elsenborn -7,9°C. Maximum snow cover: Elsenborn & Spa with 1 cm. 26 Very Sc cloudy and no frost. Slight intermittent snow / snow grains between 1000-1330. Enlarging breaks from 1600 on. Top Tmax: Ostend 3,1°C, Zaventem had 1,1°C, in my garden 1,7°C. With the windchill effect it fell like between -14/-18°C. Top snow cover: Mont Rigi 9 cm & Elsenborn 6 cm. 27 Clear night with Tmin in garden of -6,6°C. Top Tmin: Spa -11,6°C followed by St-Hubert -9,9°C, Elsenborn -9,6°C, Florennes -7,9°C, Diest -7,7°C, Kleine Brogel & Liège -7,5°C. Zaventem had -6,9°C. Towards sunrise becoming very cloudy with Sc. More breaks in afternoon, towards sunset clearing skies. Top Tmax: Koksijde 0,7°C. Zaventem had -2,4°C, in my garden -1,6°C. All station remained negative except coastal area. Top snow cover: Mont Rigi 8 cm & Elsenborn 6 cm. 28 Clear night with Tmin in garden -8,1°C. Top Tmin: Spa -10,7°C, Elsenborn -10,5°C, St-Hubert -9,7°C, Mont Rigi, Dourbes & Humain -9,6°C, Florennes -8,6°C, Diest, Kleine Brogel & Charleroi -8,3°C, Zaventem -8,0°C. Sunny day with some trailing Cirrus. Top Tmax: Spa 5,2°C, Zaventem had 2,7°C, in my garden 3,1°C. Top snow cover: Mont Rigi 8 cm & Elsenborn 6 cm. 29 Clear night with Tmin in garden -7,2°C. Top Tmin: Kleine Brogel -7,3°C, Diest -6,8°C, Zaventem & Elsenborn -6,6°C, Charleroi -6,5°C. Sunny day with a few Cirrus clouds. Top Tmax: Spa & Buzenol 9,1°C, Zaventem had 4,0°C, in my garden 4,3°C. Top snow cover: Mont Rigi 7 cm & Elsenborn 5 cm. 30 Clear night with Tmin in garden -5,3°C. Top Tmin: Elsenborn -6,8°C. Becoming very Sc cloudy from 0830 on, tempo decreasing in afternoon. Top Tmax: Koksijde 5,3°C, Zaventem had 3,8°C, in my garden 4,4°C. Top snow cover: Mont Rigi 5 cm, Elsenborn 4 cm. 31 Remaining very cloudy with Stratus & mist but no frost with 0,8°C. Top Tmin: Elsenborn -8,3°C. The Stratus disappeared from 1330 on leaving some Cirrus. Top Tmax: Elsenborn 10,2°C, Zaventem had 2,7°C, in my garden 3,9°C. Top snow cover: Mont Rigi & Elsenborn 4 cm.